A call to serve, Secrets to Imitating God encourages you to use your God-given gifts to transform yourself, your community, even your nation. In Strengthen Yourself in the Lord Bill Johnson shows, through both Scripture and personal experience, how to be strong when facing difficulties at home, work or within your family. 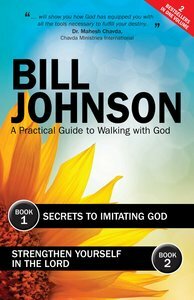 About "Secrets to Imitating God & Strengthen Yourself in the Lord (Ebook)"
Customer Reviews For "Secrets to Imitating God & Strengthen Yourself in the Lord (Ebook)"
I have only read the first few chapters of this book yet I have been spoken to by the Holy Spirit numerous times through Bill Johnson's incredible writing. In Secrets to Imitating God, he draws on the importance of creativity and the manifestation of God given gifts - including an all important chapter on how to hear God's voice. A must have for all Christians who want a new perspective on life and faith in Jesus Christ.